There’s an interesting thing about nostalgia in that you usually remember a game’s early levels very vividly, and its final level and boss fairly well, but the back half of the game is much more spotty. I’ve played Banjo-Kazooie to 100% completion at least three times in the past, but on this playthrough I’m finding it much harder to remember how Mad Monster Mansion is set up. This makes everything even more fun! Probably! As I mentioned last session, Banjo-Kazooie keeps falling into the classic platforming tropes with worlds themed around the usual things, such as grasslands, desert, snow, and a haunted house. Mad Monster Mansion is that haunted house, technically Gruntilda’s house itself, which now raises more questions yet again about how her lair works and how these worlds are set up. Entering each seems to warp us to an entrance pad, suggesting that we’re just using magic to appear in a location somewhere far away from Gruntilda’s Lair. But the locations all have things directly connected to Gruntilda, including Clanker as her garbage disposal and now her house here in the middle of a Hot Topic appreciation festival. The mansion itself is the first thing we see, looming directly in front of us upon entering the world. At three stories tall, you’d think the mansion would be the central focus of the world, but much like Gobi, the world’s name is pretty deceiving. Busting down the front door takes us to the mansion’s dining room, complete with a table, chairs, and a fireplace, all giant-sized, further begging the question of how the sizes in this world work. Gruntilda isn’t much larger than Banjo and Kazooie, yet her dining room is set up for something easily four times her size. A Jiggy sits in the center of the dining table, encased within a green ghost named Napper who, as the name suggests, immediately falls asleep. Stepping on the wooden floor makes a creaking sound that wakes him up, keeping us from the Jiggy. We’ll have to return in a little bit. All around the mansion are lit windows that you’d only think to break if you’re the sort of player who tries to break everything. But breaking them is a necessity since a lot of music notes and other things are hidden in these rooms. None of the rooms, I should add, are connected in any way, lacking even a door texture on the walls to suggest that there’s a way to go from one room to the next. I’m going to just go with “magic” since Gruntilda is a witch. That’s not the weirdest stretch I’ve had to make here, and it probably won’t be the last. Within a handful of these rooms are paintings, usually of Gruntilda or the different stages you’ve encountered so far. These contain an enemy similar to the ones found in the drains where the chomping fish pop out, except they’re skeletons here. Nothing new, just a little reskin. It’s also interesting that a painting in one of the rooms depicts a pirate that doesn’t appear in this game whatsoever but who does appear in Banjo-Tooie. I can’t remember his name, but I remember where he appears. There’s a high chance I’ll roll right into a Riding the Backlog series with Banjo-Tooie, so we’ll talk about that pirate later. Taking a detour from all the rooms on the first floor, we head to the cellar and find our first Jiggy in a barrel, as well as a Jinjo and another Stop ‘n’ Swap egg. The cellar at least makes sense to not be connected to the mansion other than the door from the outside since that’s actually how cellars are sometimes set up. No further gripes there. Up to the second floor and more acts of window vandalism has us breaking into Gruntilda’s bathroom where we get yet another Stop ‘n’ Swap egg and meet Loggo the toilet. Yes, even the toilets in this world are sentient, which creates a sort of extreme horror to existence. All animals are sentient, so you’d think being a vegetarian would be preferable, yeah? Well the vegetables all have eyes and hop around. So do rocks. So do eggs. When you hatch an egg with eyes, what’s even inside? Everything is alive, creating an existential crisis and a messed up world where Gruntilda the horrendously unhygienic witch has to crap into the mouth of a living, talking thing. Now you have that image seared into your brain forever. You’re welcome. While running around the roof I realize something that’s been messing with my perception since entering Mad Monster Mansion. The bats, of which there are many, flap around using the same sound effect that Banjo makes when he does his lazy little punching attack. It’s not a bad approximation of the sound of a bat wing flapping, but it’s off-putting and I suppose that fits with the world’s theme. 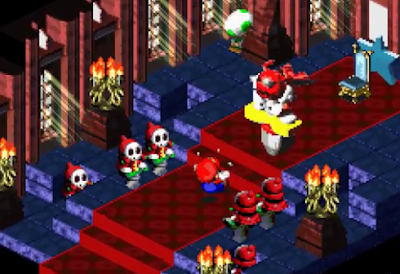 Besides the skeletal fish monsters, Mad Monster Mansion is also host to green floating ghosts and skeletons, both of which can be killed using the Wonderwing. 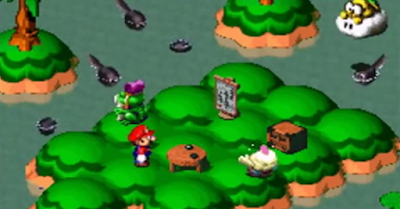 The ghosts are interesting since they look somewhat like little goblin monsters seen in Mumbo’s Mountain, a nice modification of already-created assets. The ghosts can’t be harmed unless you use the Wonderwing, but the skeletons can at least be knocked down, just not killed. Enemies in Banjo-Kazooie are little more than a slight nuisance than a real threat, something that only drastically changes for the final boss. Getting to the top of the mansion gains me access to the chimney, so I make like Santa and pop out in the dining room, this time on the side of the room with padded chairs I can use to hop on without making noise and waking up Napper. A few simple hops and I’ve taken his Jiggy, causing Gruntilda to chastise him from some unseen location. That’s actually something that happens a lot. Grunty can apparently see everything that Banjo’s doing and chimes in now and again to quip or ridicule the bear and bird duo. This usually happens when running around her lair, and always with a rhyming couplet. Actually, everyone involved in Mad Monster Mansion speaks in a rhyming couplet, so it’s definitely a trait of the locals. Time to explore the areas beyond the mansion, showing a fourth version of the hazardous water, this time poison, I suspect. We don’t actually get confirmation of this but it seems the most likely reason for taking damage. It may also be more swamp water, but who knows. To the left of the mansion is a hedge maze, though nothing too tricky to navigate. A ghost floats by, trying to damage you, but one touch of my Wonderwing and it’s dead. Er, more dead. It really feels like the Wonderwing wasn’t thought through too much since it’s only essential to get a single Jiggy in Clanker’s Cavern and then just works as a challenge removal in many of the worlds. One aspect of the hedge maze I like is that it’s possible to get on top and traverse it that way, though there are hedges adorned with roses that cause damage. It’s a nice touch and plays into the stage in a section later on. Behind the mansion and next to the hedge maze is a church, complete with tombstones all around, many of which are naturally sentient and hazardous. They look like any other tombstone until you get close enough, at which point eyes pop out and they stand up, grunting and running at you. These can at least be destroyed with a few regular attacks. There are some empty flower pots next to some of the tombstones, and of course the flower pots also have eyes. If you poop an egg into them, they sprout flowers and a creepy low voice says “thank you.” I don’t know if this implies that the blue eggs Kazooie uses are actually flower seeds, but they’ve now been used to strike enemies, feed a snake and statues, plug a hole in a bucket, and make flowers appear in empty pots. Witchcraft abounds. The church is shut tight until I can find a switch to open it, but in the meantime I’m able to climb to the top of its clock tower and get some music notes and a Jiggy. On one side along the back is a stained-glass window with Banjo’s and Kazooie’s faces on it. Again, it’s strange to see how connected they are to these worlds that they’ve never visited. Jumping inside gets you a handful of eggs and feathers, as well as an extra life which are still not really useful and were likely only included because Super Mario 64 had lives. A little pool sits to the right of the mansion, keeping a Jinjo up on a pillar. Near this is the switch to the church door as well as a pair of running shoes to make the dash before the timer runs out and the church door closes. This dash challenge is a lot easier than previous ones and only takes me one try to make it in time. Inside the church are some pews, more green ghosts, and a big church organ with a ghostly hand named Motzand who wants you to follow along and play what he’s played. In theory you’re supposed to watch him slowly play a melody on the organ keys and then replay it for him, but in practice you just stomp on the organ keys right after he’s pressed them. It sort of makes the challenge non-existent. Just follow along while each organ key makes the same sound. That’s disappointing. Jumping down from the top of the organ after collecting another Jiggy brings up another element I’ve not mentioned: fall damage. Just like most 3D platformers, falling from too great a height will result in Banjo going into freefall and landing with a pretty painful smack. Big kudos for the animation and sound effects on this one since it really does sell the impact. Also of note is that the beehives that contain three pieces of honey to replenish health (and have eyes of course) now have bees buzzing around them, so smashing them open makes the swarm of bees fly after you. I like this little change because it ensures that even the act of trying to health yourself now involves a little risk and skill to accomplish without taking further damage. The last structure in Mad Monster Mansion is a shack with light beaming out of it. This looks really alluring and has me curious what could possibly be inside. What would you guess? Some sort of spooky, eerie challenge? Not quite. This is where we meet Tumbler, an upside-down glass (a tumbler, if you will), that has a Jiggy under it. Jump on him and you’ll be able to surf around on the glass, starting a challenge with a timer. Around the edge of the room are letters and Gruntilda’s face. You have to spell something out with the letters while not touching the Grunty tiles. Oh dear, I wonder what I have to spell? If only something gave me a clue. What’s that, you think the huge floor image of Banjo’s and Kazooie’s faces might be a clue? No, that’d be too obvious. Oh well, I may never--oh, I just needed to spell Banjo-Kazooie again. By the end of this game every kid should be a pro at spelling the game’s title! There’s also a well in the back corner of the world, surrounded by more poisonous water, though it’s strange that going into the well doesn’t damage you but the water all around does. And there’s a hole in the bottom of the well that leads to the water around it, so in theory the two sources of water are connected and it doesn’t matter, I’m a bear in yellow shorts with a bird in my backpack, this game is nonsense. Speaking of nonsense, Mumbo has another transformation for me, the fourth of the game and my second favorite. For Mad Monster Mansion, I become a pumpkin. It functions exactly like the walrus in that it’s a small defenseless transformation that lets me walk over hazardous elements without taking damage and I can fit into small holes. I just like it because it’s so ridiculous and unexpected, plus it forces you to go searching to figure out how to get onto the second floor of the mansion to access a few things I couldn’t reach before, such as a honeycomb chamber under some floorboards. I’m now also small enough to fit down Loggo’s mouth, so I get to be flushed down a toilet. Just remember, I am now playing a bear and a bird who’ve been transformed into a hopping pumpkin by a shaman and I’ve just been flushed down a talking toilet to retrieve a golden puzzle piece so I can defeat a witch who’s kidnapped my sister and wants to steal her cuteness. That is the ravings of a mad man if ever mad men raved. The final Jiggy is located down a gutter pipe on the mansion’s second floor, a nice little touch to figure out as a pumpkin. Leaving Mad Monster Mansion, I’ve acquired another 10 Jiggies, 100 music notes, five Jinjos, two more honeycomb chambers, and 42 minutes of playtime, making it the new longest time in any world, though not by much. It certainly felt longer, though that’s mostly because I’m just not a fan of the horror aesthetic in things. I make sure to exit the world still transformed as a pumpkin since I’ll need it twice in Grunty’s lair, the first time to enter a shack down a pathway to the left of the world’s entrance. Inside are coffins and a ghost, as well as Mumbo Jumbo, which is weird to discover since the only context for him has been inside worlds in his skull. Here he’s just functioning to transform you back into a bear and bird so you can break open the coffin in the middle of the room and stomp a switch inside that raises the water level in another portion of Grunty’s lair. Once outside the shack and returned to my pumpkin form, I make a careful trek down a winding pathway over lava to then fit through a little hole and discover Cheato yet again, learning the spell to increase my maximum number of red feathers. It’s sort of strange that I’ve yet to meet Cheato as my normal form, instead always being transformed. I can’t remember what I’ll look like when I meet him one last time for the gold feathers cheat. I’m finally using the warping cauldrons to get around Gruntilda’s lair since it’s gotten long enough to warrant their use. Now that the water raised up I’m able to access a new section of the lair that leads to the eighth world, Rusty Bucket Bay. Come back next time where we tackle what is arguably the hardest world of them all!